Stephanie Coutts & Jonny Day started volunteering as food sorters at Kaibosh in October 2010, 8 years ago! As our longest standing volunteers, we’re honoured to feature them in our 10 Faces of Kaibosh series to celebrate 10 years. 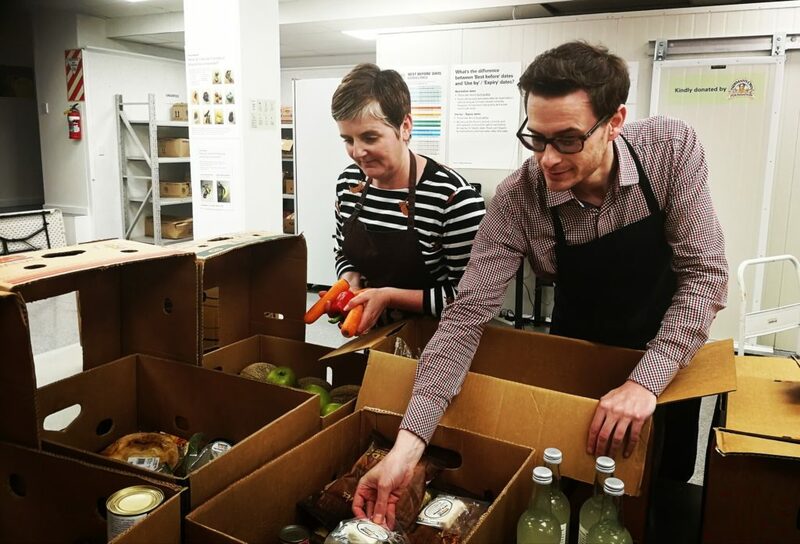 For 8 years Steph & Jonny have sorted rescued food at our Wellington base every second Wednesday evening, making sure top quality kai reaches people in need. We began volunteering in the early days when the HQ was part-time in a church hall on Taranaki Street. We’d been considering some volunteer work and chatting to our favourite bar person about it. He was an initial board member and told us about Kaibosh. It ticked lots of boxes for us – social and environmental – and it was cool to be part of something new that we knew would do good things. The team were so organised and dedicated from the start. Right from the start, it was clear that Kaibosh would have benefits for the Wellington community, and we were both involved in early work to help define the vision and purpose of the organisation. The organisation ticks multiple boxes of providing a social service and supporting the environment. And, Steph has done a fair bit of volunteering, and Kaibosh is one of the best run organisations she’s volunteered for. This is what has kept us coming back. The board and office team are great. They care about the organisation and the charities it supports and for their volunteers as well. It is a pretty easy volunteer experience – just a few hours a week to feel good about yourself! There’s good and bad! The good includes the opportunity to head to government house every now and again for a reception. It is such a great place to wander around. The bad includes one sorting session where we had boxes and boxes of mushy bananas! Jonny stopped eating them after a while – oh, and learning that rotten potatoes are the worst smell in the world! In this photo Steph & Jonny are busy sorting rescued kai at our Wellington Hopper Street base. Thank you Steph & Jonny for your continued dedication to Kaibosh. We’re so grateful to be supported by wonderful volunteers like you!